Ingolstadt says it'll enter production by the end of next year. When Audi introduced the e-tron as its first all-electric crossover, we knew it wouldn't be the last. And now the German automaker is providing a preview of a smaller counterpart in the form of the new Q4 e-tron concept at the 2019 Geneva Motor Show. As the name suggests, the conceptual electric crossover is positioned size-wise in between the Q3 and Q5. It's a fair bit smaller than the production e-tron (which is only slightly smaller than the Q7), and with 225 kW (equivalent to about 302 horsepower), it also packs a smaller punch. The electric powertrain is made up of two electric motors, combined with an 82-kWh battery pack under the floor, to give it a range of over 450 kilometers (~280 miles) – 30 miles farther than the existing e-tron. With 339 lb-ft of torque, its output is also 75 kW (100 hp) and 151 lb-ft lower than the e-tron's, so it's a little slower. The Q4 concept can run to 62 in 6.3 seconds and top out at an electronically limited 112 mph. And it can quick-charge at 125 kW to 80 percent capacity in little over half an hour. The technical details only tell part of the story, though. The concept looks both more futuristic and muscular than the Four Ring marque's current crossovers. The Singleframe grille dominates the nose (but is entirely closed off with no radiator to cool). The narrow LED matrix headlights are positioned up high, 22-inch wheels give it a proper stance, the roof tapers downwards towards the back, the taillights run the full width, the diffuser element and side skirts run high to convey a sense of pent-up energy, and the whole thing's coated in a light-shifting and -reflecting shade of Solar Sky blue. With no transmission tunnel to intrude, the cabin looks rather airy and open, encompassing four individual seats, painted plexiglass trim (instead of chrome), double-stitched Alcantara upholstery, recycled-material carpeting, and light-colored microfiber textile on the upper dash that's dominated by a 12.3-inch touchscreen, augmented by touch controls in the steering wheel and a large head-up display. Forward-looking as it is, though, the interior looks entirely realistic for production. Together with details like the full-size wing mirrors (typically replaced on show cars by spindly camera mounts), it conveys a clear intent for production, explicitly confirmed by the manufacturer. 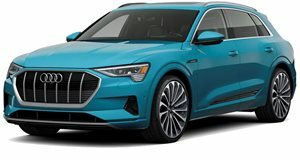 Set to begin rolling off the assembly line by the end of 2020, the Q4 e-tron will be the fifth electric Audi to reach showrooms worldwide before next year is up – joining the larger e-tron, the Q2Le-tron (specific to the Chinese market), and the forthcoming e-tron Sportback and e-tron GT four-door coupe (being developed by the Audi Sport performance division). By 2025, the German automaker intends to roll out no fewer than twelve EVs – including Avant wagon and Sportback variants – all based on the common Premium Platform Electric architecture developed with sister-brand Porsche.